Efrain Munguia take a selfie with a statue of an alien during the 7th annual Edinburg "Out of This World" UFO Conference at the Edinburg City Hall Courtyard Friday, April 13, 2018, in Edinburg. 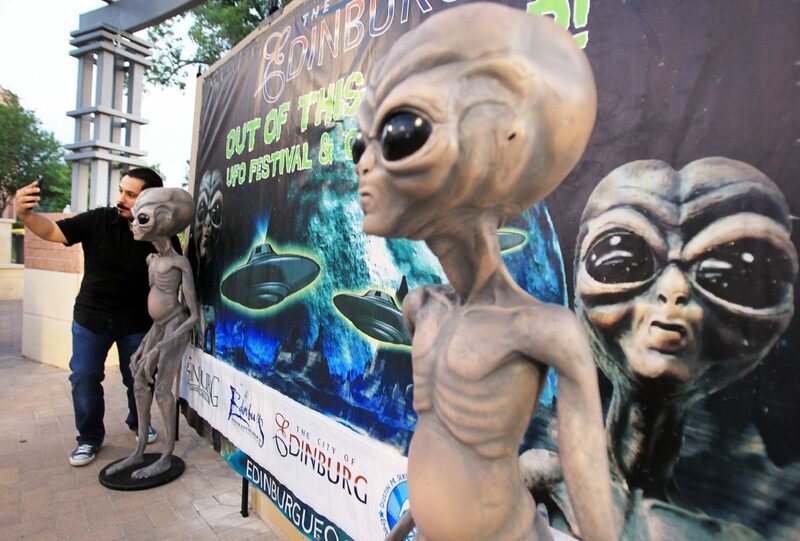 EDINBURG – Over the past two days, believers and nonbelievers alike gathered for the 2018 “Out of this World” UFO Festival and Conference. Kicking off the 7th annual event, participants trekked to local site where a UFO is said to have been witnessed. Library staff, speakers and guests madetheir way Friday to the 1966 original incident site near McCook, a rural farming community north of Edinburg. There, on Farm-to-Market Road 490, a UFO reportedly was sighted one night in 1966. As the story is told, on an evening in either October or November, J.R. “Milo” Ponce, a deputy sheriff for Hidalgo County, received a phone call around midnight from the department’s dispatcher stating someone had called to report a group of “disturbed” men standing alongside FM 490. The men, who were in the middle of a job for their company, were agitated because of what had just occurred while working through the night. The workers said they saw bright lights in the sky and heard a loud humming. They also saw flames shoot out of the sky, which they thought was a UFO hovering over the area. The fire ultimately damaged the crew’s belongings. By the time firefighters arrived at the scene, it was a loss and the crew eventually left town out of fear. 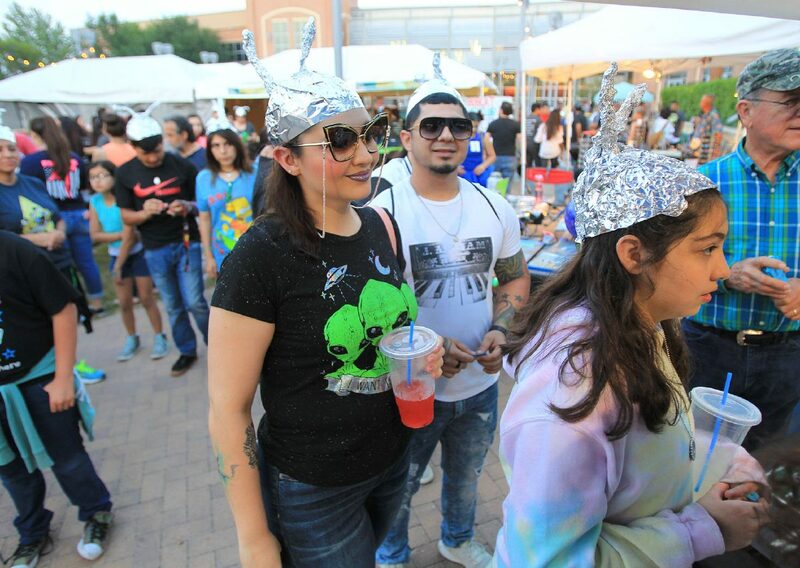 Visitors wear aluminum foil hats as they wait in line during the 7th annual Edinburg "Out of This World" UFO Conference at the Edinburg City Hall Courtyard Friday, April 13, 2018, in Edinburg. 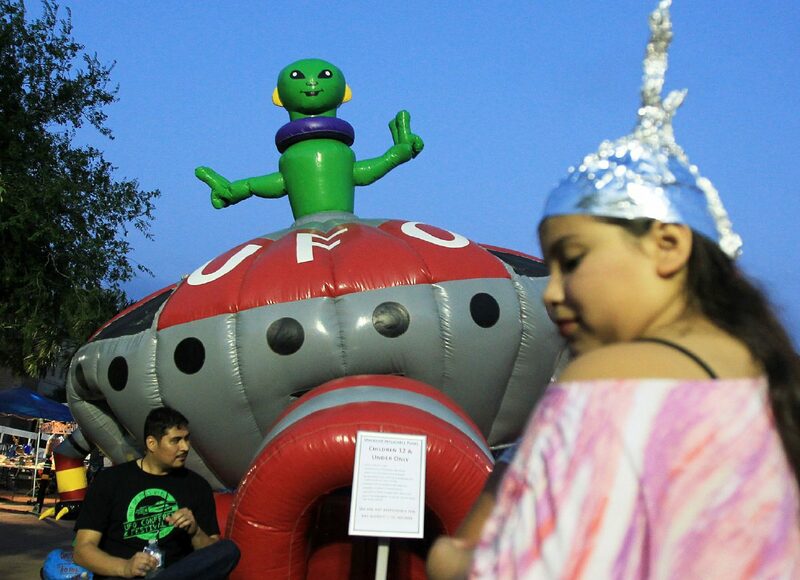 Diana Ramirez, 10, waits in line to ride a UFO-shaped bounce house during the 7th annual Edinburg "Out of This World" UFO Conference at the Edinburg City Hall Courtyard Friday, April 13, 2018, in Edinburg. 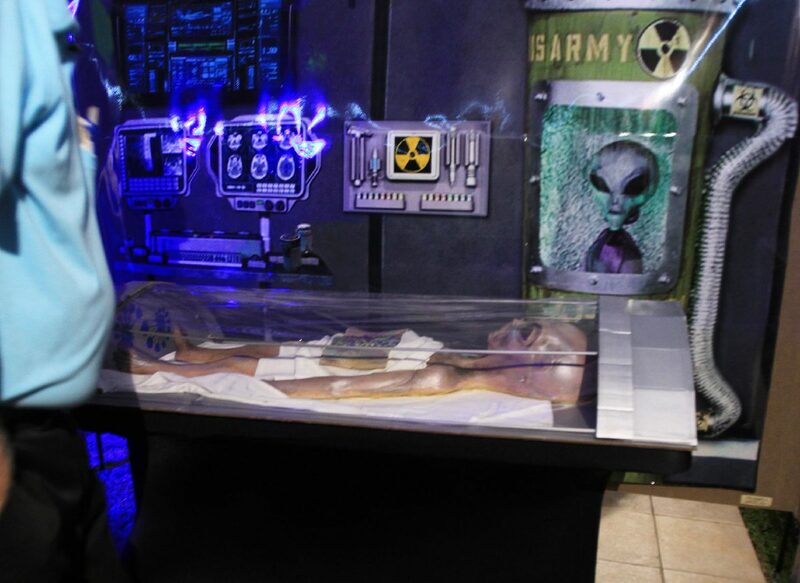 A mockup of an alien autopsy was on display during the 7th annual Edinburg "Out of This World" UFO Conference at the Edinburg City Hall Courtyard Friday, April 13, 2018, in Edinburg. 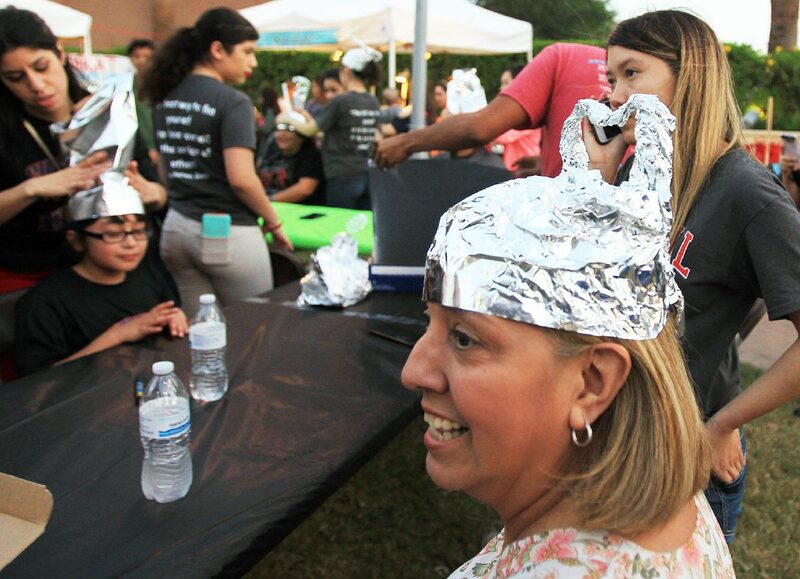 Sophia Melendez, right, wears an aluminum foil hat shaped to her head during the 7th annual Edinburg "Out of This World" UFO Conference at the Edinburg City Hall Courtyard Friday, April 13, 2018, in Edinburg. The story has become a staple of the UFO conference each year. Following the field trip, the public was invited to attend the festival held at the city hall courtyard. Letty Leija, director of the library and cultural arts for the city, said the festival and conference began with author and UFO researcher Noe Torres, who wanted to hold a presentation of his book release one year. “We had the book presentation and it was a full house, so the next time around (we said) let’s do it again,” Leija said, noting the second-year event filled the city auditorium. With the continued popularity of the event, the festival was expanded to a two-day community event. This year’s festival included a mock-up alien autopsy tent, which featured UFO history. Participants were encouraged to make tinfoil hats, in whatever design they wished, while viewing exhibits such as a planetarium from the International Museum of Arts and Science and telescopes for viewing the night sky. Veronica Muñoz, who attended with her children and nephew from Donna, said her daughter Briana is fascinated by aliens. “I like the alien movies and I do research on aliens,” Briana said, who calls herself a true believer. “She has everything of aliens,” Veronica added. Torres, the Edinburg native whose UFO books led to the founding of the festival, said he has been fascinated by UFOs since childhood. His interest was stoked as a youngster by checking out all the UFO books in the library. When he began publishing his own books on the subject, he found much community interest in UFOs. They decided to put on a festival similar to one in Roswell, New Mexico, a UFO hotspot. Since its inception, the conference has always featured guest speakers and well-known researchers, some whom have been featured on TV documentaries on aliens. The 2018 guest speakers included Travis Walton, a 1975 UFO abductee. He said he encountered a UFO while working in a Northern Arizona forest, during which he went missing for five days. Also featured was Nick Pope, a British UFO expert, who shared stories of UFO files during his work with the British Ministry of Defense. Other speakers included Stephan Basset, a UFO researcher and an advocate of governmental disclosure about UFOs, and John Greenewald, a UFO researcher who has been compiling data on extraterrestrials since his teen years and who has accumulated a large collection of documents. Jesse Marcell attended the conference from New Braunfels because the subject peaks his interest. “It’s very interesting and you get to hear from different sides of the story,” Marcess said. “And now we know that there is such thing called UFO AATIP Program that the U.S. government is still researching on.